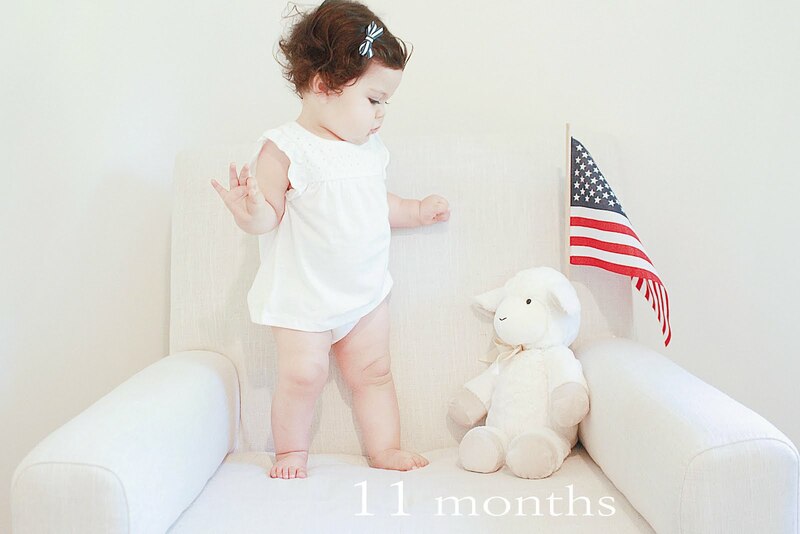 Where to start, from 10 to 11 months I feel like Pey grew leaps and bounds! Besides the fact that she practically runs everywhere she goes, she cleans up her toys, blows kisses and became a professional straw drinker. She is extremely active and always on the go which has me in serious need of coffee all the time. > Found her favorite stuffed animals, Lamby the Lamb and Hootie the Owl, bet you couldn't guess that. > takes a sip of water and says "ahhhhh" hopefully you've caught it on my snap! > continues to have so much fun drinking out of a straw, but loves her sippy cup too. > stopping to stare at strangers until they acknowledge her! > she finds it absolutely hilarious when she pushes her highchair around the room after the dogs, it's a crack up. > she will now sit down if she doesn't want to be picked up! > Fruit is her everything (just like her mama, I could live off fruit) Banana, Raspberries and watermelon being her top faves. Growing up faster and faster, this little lady was finally completely stable and confident with walking a week into this month. She even picks herself back up if she falls, it takes a lot to make this one cry. I have one more month of her month to month updates and I'm super freaked out. What's next? 1 and a half? I'll tell you one thing, I spent a good 3 hours looking through her birth photos and videos. Of course, this only makes me ready to clip on koala Rod for another one! Stupid little event in November called a Wedding is holding me back though! I WILL fit into my dress! Haha ok, in all seriousness I definitely need a little more time. How much time are you mommies taking? What's a good age gap you think?